'The Invisible Woman' marks Ralph Fiennes’ second outing as director, while also starring as the complex figure, writer Charles Dickens. In 1857, at the height of Dickens’ career, he pursued a love affair with a young actress, Nelly Ternan. Claire Tomalin’s pioneering biography of Dickens has been adapted by British screenwriter Abi Morgan ('The Iron Lady', 'The Hour'). 'The Invisible Woman' is an elegant recreation of the times. The 'The Invisible Woman' competition has now closed. Winners will be announced shortly. Competition opens at 5pm AEST on Sunday 31st August 2014 and closes at 11:59pm AEST on Sunday 7th September 2014. Five winners will be chosen at random on Monday 8th September 2014. To successfully win, entrants must fulfil the above entry conditions before the time the competition closes. Current members/followers are eligible to enter the competition. Only one entry per person. Only one winner per household. To be a valid winner, the entrant must not have won a prize from SWITCH within the last 28 days. 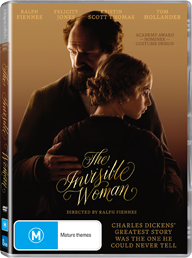 Each winner will receive one DVD copy of 'The Invisible Woman'. By entering, you agree to receive occasional emails from SWITCH in the future. If you decide to unsubscribe from these updates, any further entries will not be applicable. Only Australian residents are eligible to enter. 'The Invisible Woman' is available on Digital HD and DVD on Wednesday the 3rd September 2014 from Entertainment One.